This is my finished digipak - my main theme is the juxtaposition of vivid colours against dark background. It represents the semiotics of colours and how colour can represent emotion - i.e light = happy, dark = sad. Since our artist is called SPCTRM, meaning a spectrum of colours - we represent a different wave of emotions with the power of music. I chose to used jarred typography in the front cover as it gives an imperfect feel to it. Unlike bands that follow a mainstream convention such as one direction, the photo on the front will be immaculate and will contain no flaws; this is because this band relies on their appearance to aid their album sales. Since I would consider my band as anti-establishment and doesn't follow mainstream trends - but - I would say I follow my genre's convention. I chose to use a different typography for the back due to the aesthetic pleasure that I liked with this font. It also follows the 80's feel I wanted to go for. Each panel contains a different side of this ambiguous girl and then her hidden face is on the CD. 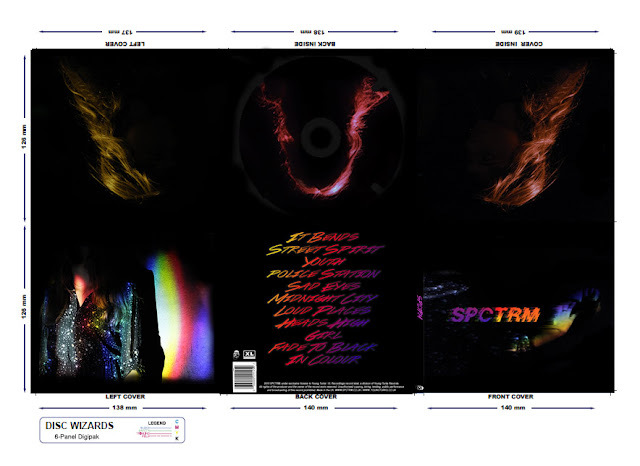 I wanted to have a 360 degree view of her on the digipak because with a meaningful album, it's very personal to the artist and allows you to get to know them.